If you think your kids will never eat anything healthy -- think again! Learn how to make the meals your children already love -- but with secret sneaky ingredients that pack a healthy punch. Your kids will never suspect that there's blueberries pureed into their brownies, cauliflower in their mac 'n' cheese, or sweet potatoes in their lasagna -- but they'll love every bite! 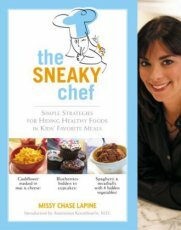 Here are simple, practical recipes and techniques that will help every busy parent create healthy meals for the whole family.